Stomach spasms are involuntary contractions in the upper or lower abdominal area that can feel like anything from a twitching stomach to sharp, sudden cramping pains. Because there are many organs in the abdominal region, sudden stomach contractions may cause you to worry. Very often stomach spasms are caused by gas, constipation, stomach bugs and viruses, or even stress. Light stomach twitching could even be an early sign of pregnancy. However, some types of spasmodic stomach pain can be a sign of a more serious health condition like appendicitis, stomach ulcers or inflammatory bowel disease. Depending on the underlying cause of your stomach cramps, there are many natural home treatments to remedy spasmodic stomach pains. For example, if you experience stomach spasms after eating, you could try home remedies like drinking ginger tea, baking soda and water, or chamomile tea. Or intestinal cramping after eating could be a sign of a food allergy, in which case you will have to identify the trigger. In this article, I’ll examine the various causes of stomach spasms to see what the symptoms mean. You will also find many practical home remedies that effectively relieve many stomach aches and pains. Very often, you can find relief from stomach spasms or cramps by taking natural remedies that include ingredients to reduce and calm inflammation in the stomach. Food poisoning is a very common reason for experiencing painful stomach spasms. Food poisoning occurs when you consume food or drink that is contaminated with bacteria, viruses, or parasites. Usually, the symptoms of food poisoning resolve themselves. However, there are many natural home remedies to relieve the uncomfortable symptoms of food poisoning and speed up the healing process. To make ginger tea, you should chop a 1-inch piece of raw, fresh ginger. Put the ginger pieces in a cup and pour boiling water into the cup. Cover the cup and leave to infuse for a few minutes. Drink regularly throughout the day to get relief from stomach spasms. Gas can cause bloating and stomach spasms. As gas builds up in the stomach, it causes it to stretch, resulting in pain, discomfort and sometimes hard stomach. Very often, you can relieve the spasmodic pain in your stomach by passing gas. However, that may not always be practical or advisable. It is very easy to make chamomile tea to relieve painful stomach spasms caused by flatulence. To find how to make a gas-relieving herbal tea from chamomile and other herbs, please read my article about the most effective home remedies for gas and bloating. Viral infections can cause gastroenteritis which inflames your intestinal tract resulting in mild to severe abdominal spasms. Gastroenteritis has symptoms similar to food poisoning and may last for a couple of days. Dr. Emily Wax from the Brooklyn Hospital Center recommends using the bland diet if you have gastroenteritis or food poisoning.7 The bland diet helps the intestines to recover from viral or bacterial infections because it avoids foods that could irritate your intestines further. For example, you should avoid fatty, fried and spicy foods which are harder for your body to digest. You could also drink soothing ginger tea to help reduce inflammation in your intestines and reduce crampy pains caused by viral stomach infections. In fact, to help boost the anti-inflammatory properties of ginger tea, add a teaspoon of turmeric. For the recipe to make your own anti-spasmodic tea, please read my article on the health benefits of drinking ginger and turmeric tea. There are a number of digestive problems that can cause stomach spasms in the lower or upper abdominal areas. Indigestion. A common symptom of indigestion is stomach aches in the upper abdomen especially after eating or drinking. The intestinal pains are caused when stomach acid causes irritation and inflammation of the lining of the digestive system. Indigestion can also cause nausea, burping, and feeling bloated. Heartburn. Pains and aches in the upper abdomen can also be caused by heartburn. Heartburn happens when stomach acid leaks back up the esophagus and irritates its delicate lining. Although it may not cause sharp contractions in the abdomen, the pain can cause a lot of physical discomfort. Gastroesophageal reflux (GERD). GERD is severe or chronic acid reflux that can lead to complications, such as cancer. Similar to heartburn, GERD causes pain in the upper abdomen when acidic stomach fluid gets into the esophagus. With many digestive disorders that cause aching spasms in the digestive tract, Dr. David T. Derrer on WebMD recommends using baking soda to calm the stomach and neutralize the acid which is causing the painful symptoms.9 You should mix 1/4 – 1/2 teaspoon of baking soda in a glass of water and drink after each meal. 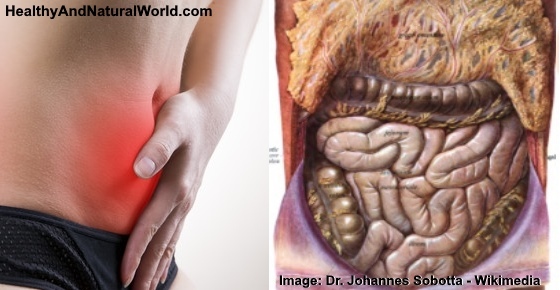 Continue doing this for up to two weeks to relieve painful symptoms of digestive issues. If your symptoms don’t improve after 2 weeks, Dr. Derrer advises visiting your doctor for a checkup. There are many other home remedies for digestive disorders that I’ve written about on this website. You can try aloe vera juice, apple cider vinegar or even cayenne pepper to relieve the symptoms of stomach burning and abdominal pain after eating. Spasmodic pains in your lower abdomen are a common symptom of constipation.10 Of course, you know you have constipation when you have difficulty passing stool or your feces are hard and compacted. However, the hard stool will also stretch the intestines causing crampy abdominal pain. One of the best ways to soften stool and alleviate the discomfort of constipation is to eat plenty of fiber in your diet and drink enough water every day. Another natural home remedy for constipation is to take castor oil. Castor oil works as a natural laxative to help pass stools easier and more frequently. You should take 1 to 2 tbsp. castor oil on an empty stomach. Use the castor oil home remedy 1-2 times every day for up to a week to help get rid of cramping stomach pains that constipation causes. Probiotics can also help to treat constipation, regulate bowel movements, and reduce bloating. Being in extremely stressful situations can cause twitching pains in the stomach. In fact, the stomach spasms could get so severe that it causes diarrhea or other problems in the digestive system. Prolonged stress can severely impact on your body’s health. Therefore, it’s important to learn how to control stress in a natural way to prevent gastrointestinal disorders, anxiety, panic, and sleepless nights. To control stress naturally, you can learn about my 14 effective stress-reducing techniques to help you regain control of your life. Or you could use the calming effect of essential oils to help get rid of stressful feelings and relax better. If you are a woman, mild to severe spasms in your lower abdomen region could be caused by menstrual cramps just before or during your period. Dr. Gaither suggests putting a heating pad or hot water bottle on your lower abdomen to relieve the spasmodic pain. You could also try to avoid drinking caffeine and alcohol to see if that helps to prevent the abdominal spasms. For more practical advice on how to relieve cramping pains during your period, please read my article about the best natural ways to relieve menstrual cramps. Some women experience stomach cramps with no period. If you are interested learning about the causes of cramping pains that don’t result in a period, please read my article here. Certain bowel conditions can cause long-term and recurring abdominal pain. The Journal of Clinical Gastroenterology says that enteric-coated peppermint oil capsules are a safe and effective treatment to relieve the symptoms of IBS.14 Peppermint oil capsules is just one of the many effective natural remedies to relieve IBS that you can find on this website. Many people have found that Manuka honey helps to relieve IBD symptoms including stomach spasms and inflammation. Take one spoon of honey daily when you have flare-ups of your IBD symptoms to relieve the inflammation that causes cramping stomach pain. Pains that are crampy in nature and that occur after eating could be caused by food allergies or intolerances. Allergic reactions happen when the body mistakes a specific food as something harmful and releases histamine which can cause itchy skin, a runny nose, nausea after eating, vomiting, cramping, and diarrhea. Other common food allergies are triggered by peanuts, tree nuts, fish, shellfish, and eggs. Some people suffer from Celiac disease, which causes an immune response to foods containing gluten. If you think that a food allergy is causing your stomach spasms, you should keep a food diary to try and identify any potential triggers. Once you know which foods are causing allergy symptoms, you should avoid consuming those foods to prevent allergic reactions. Not all sharp jabbing stomach pains can be treated with home remedies. If the stomach spasms are very severe and won’t go away with natural treatments, you should visit your doctor. One of the first symptoms of appendicitis is sharp unexpected pains that start around your lower right abdomen. The pains usually gradually become more severe and spasmodic as the inflammation gets worse. Appendicitis can become a life-threatening condition and requires emergency medical attention. If you have severe abdominal pains around the location of the appendix that continue to get worse, you should call a doctor immediately. The only way to be certain that you are pregnant is to take a pregnancy test.